When you start working with SAP Web Intelligence and Information Design Tool (IDT) or even if you are a regular user, it is normal to find some challenges. In this post, you will find some tips and tricks that could save you a lot of time and headaches. Format the numbers of a graph or report: It seems easy but sometimes it can be problematic to find out where you should change the format of a number in a report. For changing the format of a number in a chart, you must right-click on the number of the chart -> "Format Chart..." -> "Value Axis" -> "Design" -> under "Number" you could find "Format pattern", you can even customize its format. For the numbers in a column do a right-click on the column -> "Format Number..." . Merge the different columns of a break with same value: When you create a break in WebI, by default the columns with the same value appears blank. If you only want to have one merged column you will need to follow these steps; Right click on the break cell -> "Break" -> "Manage Breaks..." -> "Duplicate values" mark "Merge"
Remove the alphabetical order from columns: By default the column of a WebI report has alphabetical order. 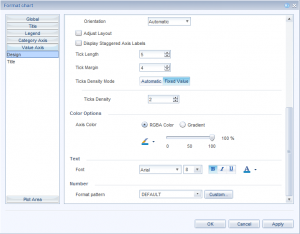 Luckily, WebI allows you to create customized sorts of a column. To create a customized sorting, first select the object to sort and then access to the corresponding menu. Select “Custom sort”. You will need to change the order. You can also put new values to the sorting. If a word does not appear in the sorting, it will be added at the end of the sort. Note that this custom sort will be applied everywhere you have this column variable. Remove document security from WebI file: You should use the “Save for ALL Users” option. It is good to use it when you want to transfer *.wid files from one computer to another without facing further security problems. Use information from the previous row: There is a WebI command called 'Previous' that allows you to get the information from a variable of the previous row. This is very interesting if you have variables dependent from previous rows. Remove the limit of rows and query time from an universe: Sometimes you run a WebI report and after certain time it stops with no apparent error message or it comes with less information than expected, this is because by default the Universes comes with a limit of time execution and rows. This is one of the most typical problems you could find with a large amount of data sets. It is easy to forget to change or disable these values. You can find these options under the "Business Layer" -> Click on the universe name -> "Query Options" -> "Limit size of result set to" and "Limit execution time to" options. Publish changes on Data Foundation Layer seems not to work or appear: This is an another common issue. If you change something in the Data Foundation Layer you should force a change in the Business Layer, for example, erase a letter of a variable and rewrite it and save both layers. After this, you will be able to publish and changes will be applied. Change Join lines layout: In big Universes with a lot of tables and joins, the join lines could start to be confusing. There is a way to change the layouy of this lines in "Window" -> "Preferences..." -> "Information Design Tool" -> "Data Foundation Editor" -> "Appearance" and make them clearer. Use of families: If you want to have everything organized, IDT gives you the possibility of using "Families". For example, you could use families for each facts and tables related to them or for Alias, etc. HTML tags in description of variables: If you want to impress your users with some extra quality in your Universes, IDT allows you to use HTML codification in the description label of a variable. Hope this canvhelp to make your life easier with Web Intelligence and Information Design Tool on a daily basis. If you have any tip and trick or comment you want to share, do not hesitate to add them below and make this entry more valuable.